Anchovy Toast consists of anchovies beat in a mortar, with fresh butter, to a paste, and highly seasoned with Cayenne, currie powder, mustard, &c.
Deviled Biscuit is the above paste spread on a biscuit, seasoned, and warmed in a Dutch-oven. 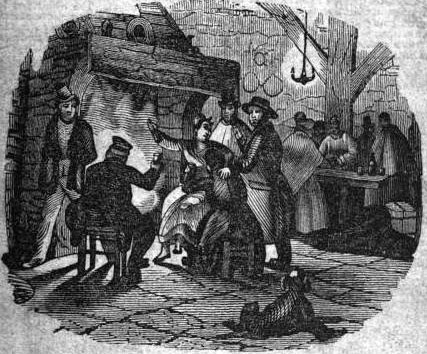 A brace  of woodcocks rather underroasted, and dished up very highly over a spirit-lamp, make a very fine devil." Dr. Gastaldy's Biscuit for Drinkers. This is neither more nor less than an exquisite slice of cheese, fitted nicely to one of Le Mann's biscuits, previously buttered with the best Epping. The best cheese for this purpose is Gruyere, or old ripe Stilton, (taking care that it be not greened with poisonous verdigrise.) Those who are novices in cheese-tasting, will find Dutch the best, but no scientific amateur can bear the sight of it. Mr. Wallace says he prefers old Dunlop, provided it be well salted, and "hotchin' wi' mites." A still better is Dr. Kitchener’s Pandemonian Biscuit"
Three or four slices of Bread, Toast and Butter well on both sides—nine or ten Anchovies washed, scraped, and chopped fine)—put them between the slices of Toast,—have ready the yolks of four Eggs well beaten, and half a pint of Cream which set over the Fire to thicken, but not boil—then pour it over the Toast, and serve it to Table as hot as possible. Bone and wash the anchovies, pound them in a mortar with a little fresh butter; rub them through a sieve, and spread them on a toast. Obs. —You may add, while pounding the Anchovies, a little made Mustard and Curry Powder (No. 455), or a few grains of Cayenne, or a little Mace or other spice.- It may be made still more savoury, by frying the toast in clarified butter.—“Good, to make a cup of good drinke rellish well, and may well be called the Drunkard’s ' Delight,” saith Dr. Harte—See his Book on Diet, folio, 1633. Is the above composition, spread on a biscuit warmed before the fire in a Dutch oven, with a sufficient quantity of salt and savoury Spice (No. 457), Zest (No. 255), Curry Powder (No. 455), or Cayenne Pepper sprinkled over it. Obs.-—This ne plus ultra of high spiced relishes, and frequently makes its appearance at a tavern dinner, when the votaries of Bacchus are determined to vie with each other in sacrificing to the Jolly God.